Wearing unstable dentures can be very annoying. The good thing is, this can be easily solved by having Implant Dentures. Conventional dentures usually rest on some teeth, the gums, and other surrounding tissues in the oral cavity. However, when you do not have any teeth on your jaw, regular dentures would not be advisable. For these cases, Implant Dentures are used. These tooth restoration options are actually overdentures supported by dental implants which are inserted into your jaw. Usually, Implant Dentures are made for the lower jaw, where regular dentures have the tendency to be less stable than they should be. Bar-Retained Dentures – supported by a thin metal bar that follows the curves of your jaw. This requires two to five implants to be placed into your jawbone. Ball-Retained Dentures – held in place by pairs of balls (male attachments) and sockets (female attachments) which are found on the implants and the denture, respectively. An initial consultation is required so as to assess if you are a good candidate for dental implants. Once deemed suitable, a treatment plan can be discussed. The timeframe for the entire procedure may vary as it can be influenced by a number of factors. Usually, it would take 5 months for the lower jaw and 7 months for the upper jaw. Two surgeries are required: first, to place the dental implants into your jawbone; and next, to expose the top of the implants. Before the second surgery, the implants are allowed to fuse with your jawbone first. This takes around 3 to 6 months. 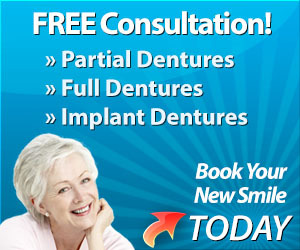 Once the dental implants are ready, the implant denture can then be worn. The success rate of this advanced procedure is high and your trusted dental prosthetist here at West End Denture Clinic will provide you with sufficient guidance as you undergo the treatment. Get rid of those unstable dentures right away. Experience the comfort and confidence of having high-quality Implant Dentures done by your reliable dental prosthetist here at West End Denture Clinic. We can provide you with a wide range of solutions for tooth loss and missing teeth. Take the first step towards gaining back that perfectly healthy smile by calling us today on (07) 3844 0944 or simply booking your appointment online.